We sailed from Zakynthos to Poros today and after about 2 hours on a single close hauled tack headed in exactly the right direction decided to take the sails down so we could have a late lunch as we motored in for the final hour. Helen rightly preferred to prepare and eat lunch with the boat level rather than heeled over! The mainsail went away very easily but the headsail was having none of it. After it was furled in and secured and we thought we’d completed the task the headsail suddenly re-opened completely. 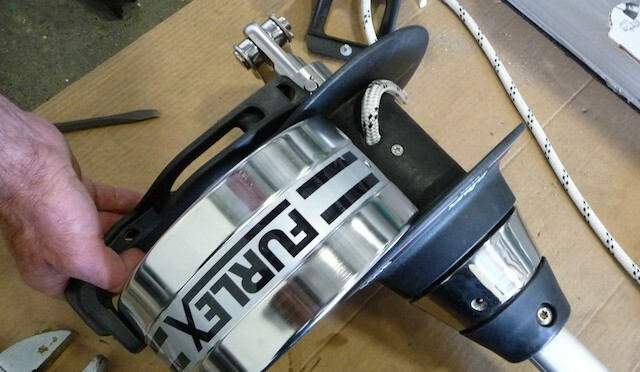 It was quickly apparent that the furling drum (used to wind the headsail back in) had broken apart and both the headsail and furling line were completed unwrapped. We had no way of winding it back in. With Harry & Tom looking after the helm, Helen and I had no choice but to go forward and drop the headsail completely. This didn’t work either as the wind was blowing about 18kts – the power was absolutely staggering – completely locking the sail into it’s forestay track. We struggled for about 30mins and managed to lash most of it to the deck and guard rails. Both Helen and I were fighting the sail which was incredibly aggressive. Fair do’s to Helen for dealing with a fairly horrible situation. We then resumed motoring to Poros. In the lee of Kefalonia the wind dropped right down and we re-visited the task and were now able to drop it safely and completely. Later in the evening we were able to fix the furling drum and raise the sail again – another first and one I would have preferred to do with others more experienced than me. The tops of our arms are quite heavily bruised from being viciously slapped and tugged by the flapping sail. Every time something goes wrong in sailing I do (some time later) look back and see it as a learning experience. I did make a call later to Jim at Nomad Sailing and he gave me some great advice on how to reduce the forces in such a situation should it happen again.